We’d love your help. Let us know what’s wrong with this preview of The Massacre of Mankind by Stephen Baxter. To ask other readers questions about The Massacre of Mankind, please sign up. I remembered that the original The War of the Worlds was written as an account, a narrative, and as such, there's generally no good wrap-ups unless forced... and that's true for reality Thanks to Netgalley for the ARC! Baxter’s sequel to H.G. Wells’ classic is at once a continuation of the original story, a meta-critique of that novel, and an alternate history that plays with the many theories of life in the solar system that were circulating in Wells’ time. This time, Julie Elphinstone – a supporting character in War of the Worlds – is the protagonist and narrator. She introduces herself a journalist and former sister-in-law of the original nameless Narrator of War of the Worlds, here called Walter Jenkins. S Baxter’s sequel to H.G. Wells’ classic is at once a continuation of the original story, a meta-critique of that novel, and an alternate history that plays with the many theories of life in the solar system that were circulating in Wells’ time. This time, Julie Elphinstone – a supporting character in War of the Worlds – is the protagonist and narrator. She introduces herself a journalist and former sister-in-law of the original nameless Narrator of War of the Worlds, here called Walter Jenkins. She indicates from the beginning that her narrative of the second Martian war is compiled from her own experiences and from other reports collected from around the globe following the conclusion of the war. From the beginning, it is made clear that humans have managed to prevail again, leaving the “what” and the “how” for the reader to discover. Despite some distracting post-modern affectations, such as the constant critiquing of Jenkins’ (meaning Wells’) original narrative of the first Martian war, and the incessant name dropping of famous historical figures and their actions during both wars, Elphinstone’s story is fairly riveting through the first two thirds or so, but Baxter makes a critical mistake in detouring from the tale just as the “solution” to the second invasion is about to present itself. Elphinstone suddenly takes us on a world tour of the war’s events, leaving us in a state of excruciatingly protracted suspense, while introducing us to a mostly entirely new cast of characters, with even more celebrity name dropping and alt-history shenanigans, before bringing us back around for a rather anti-climactic finale. I appreciate Baxter’s willingness to expand the borders of this interplanetary war beyond the shores of Great Britain, but I think he badly mishandled the execution in this case. The denouement is also overlong, though it makes a few interesting observations and is not lacking for poignancy. The Massacre of Mankind is, at times, a worthy sequel to Wells’ classic, but falls a little short of the greatness is aspires to. That said I really enjoyed it. I specifically re-read WotW in preparation for this and was glad I did, as Stephen Baxter has tied this sequel into the original superbly. My view of the book is that it is a little too long, that said it is not too long in every part of the book. For the first 150 pages it moved along very swiftly , then for the next 100 pages I felt it was a bit too drawn out, before the last 200 pages fairly whizzed along towards the conclusion. It reads very much like the original and uses many of the same characters from WotW so in that respect Stephen Baxter has done an amazing job. The Massacre of Mankind is a book that wears several hats and for the most part wears them all well, serving as a sequel to H.G. Wells’ The War of the Worlds while also paying loving tribute to it. Taking place in 1920, approximately 14 years after the events in the original classic, the story continues through the eyes of Julie Elphinstone who now begins her own account of a second invasion. Yep, that’s right, the Martians are back, and they’ve learned some lessons from their first go-around. This time, it’ll take more than microbial infections to take them down, and worse, Earth isn’t exactly in its best fighting shape. Still rebuilding from the first Martian assault, places like Britain are still in complete disarray politically, socially, and economically, especially in the wake of this alternate world’s version of World War I. While everyone knew that another invasion was possible, governments and armies thought they were prepared. They thought they knew how to beat the Martians and dismissed the warnings of the original narrator of The War of the Worlds—identified here as Walter Jenkins—who correctly predicted that the aliens would come back in force after adapting and developing new ways to avoid being defeated again. Now things are looking very bad for Earth, with extinction threatening the human race once more. Lately I have been seeing a lot more efforts by publishers and authors to bring back popular characters and classics from the past, either through “reboots” or “official sequels” like this one. I’m still torn as to how I feel about this trend, but I suppose we also have to look at each work on a case-by-case basis. According to the description on the cover, The Massacre of Mankind is fully authorized by the H.G. Wells Estate. Presumably working under their direction and support, Stephen Baxter still nonetheless had some rather big shoes to fill, given the prominence of The War of the Worlds in popular culture and the staggering number of adaptations and retellings it has spawned since being published. In writing this follow-up, Baxter had to tell an equally gripping story while staying true to the style and spirit of the original, with the added challenge of presenting something new to the table. On the whole, I think he has managed to do that, though as with any project of this nature, a reader’s enjoyment is going to largely depend on how well they know the source material. If you haven’t read The War of the Worlds (or, like me, you read it so long ago that you hardly remember anything from it at all), then you’ll probably not like this book as much as someone who is familiar with Wells’ original, for Baxter basically uses it as a jumping off point. Expanding the story from there, he puts forth what is also in many ways an alternate history of what might happen if the Martians had a second chance and were more prepared to dig in and set up a system for colonization. As well, there are strong ties to characters and events in the original, such as the protagonist Julie, who appeared in The War of the Worlds and is written in this book as the former sister-in-law of Walter Jenkins. If I could do it all over again, I definitely would have refreshed my memory with a re-read of The War of the Worlds before tackling this one, because I think I would have enjoyed myself more if I had. I suspect too that the first half of The Massacre of Mankind wouldn’t have felt so dry to me if I had felt more connected with Baxter’s drawn-out descriptions of the various events and characters, especially given how much build-up is involved in the intro. The narrative didn’t hook me until well into the second half, and even then I had to really force myself to make it through the slower sections. To Baxter’s great credit though, he’s gone all out in making us feel like this is a real sequel (perhaps even one that could have been written by Wells himself), adopting a style that recalls the time in which The War of the Worlds was written, including certain quirks and anachronisms of the period. Sure, sometimes a bit of the modern may leak through here and there, but overall the attention to detail is astounding and I can’t even imagine the level of research that must have gone into the writing of this novel. I also liked that we got to see this invasion play out on a more global scale, which I believe was an aspect that was lacking in the original. I have to admit I was a bit hesitant to read a sequel to H.G. Wells classic The War of the Worlds. Usually I am left disappointed by continuations of classic stories that I love. Authors either try too hard to copy the writing style and feel of the earlier tale, or they don't try hard enough. In a majority of cases, sequels leave me feeling a mix of disappointment and annoyance. So when I received a lovely hardback copy of this new book by Stephen Baxter, I have to admit that the book sat on my I have to admit I was a bit hesitant to read a sequel to H.G. Wells classic The War of the Worlds. Usually I am left disappointed by continuations of classic stories that I love. Authors either try too hard to copy the writing style and feel of the earlier tale, or they don't try hard enough. In a majority of cases, sequels leave me feeling a mix of disappointment and annoyance. So when I received a lovely hardback copy of this new book by Stephen Baxter, I have to admit that the book sat on my desk for weeks because I had to build up the courage to read it. The book is high quality and the cover art is wonderful....so it looked quite nice on my desk. But an unread book is an adventure not taken....so I finally took a deep breath and started reading. Immediately I knew that Baxter was not going to disappoint me! The Massacre of Mankind is well-written and a fitting sequal to Wells' classic. It has been 14 years since the last Martian invasion.....and they are back. Martian technology looted from the remnants of ships from the last invasion has been used to give humanity a huge tech boost. With one eye on the sky, humanity moves on, content that they can thwart any more threats from Mars. One man, Walter Jenkins, tries to caution people.....the Martians might have learned from their loss and become better prepared to fight for control of Earth. Turns out he's right -- the aliens return and attack again, with even more fire power and nastiness than they unleashed the first time. This book is in an alternate timeline where the Martian invasion and alien technology have an effect on history and world events. Wave after wave of Martians and colonization of our planet take H.G. Wells vision to an all new level. Just a lovely and thrilling sequel to one of my favorite classic sci-fi stories!! Before this, I had only read a Doctor Who book by Baxter. I will definitely be checking out more of his books! I thoroughly enjoyed this story! The cover art is superb as well! It's been a long time since I read The War of the Worlds, but I remember loving it - the descriptions of the Martian ships, the heat ray, the terror of the people, the rather quirky ending. So when I saw this sequel had been endorsed by HG Wells' estate, I was intrigued. Unfortunately, as so often, I came away from it wishing that sometimes (most times) great books could just be left to stand as they are. The basic plot of the original is that when the Martians arrive, the humans try everything they can to defeat them, but the Martians are so technologically superior they can overcome any of humanity's weapons. These repeated failed attempts go on, interspersed by the narrator telling of his own experiences and describing the devastation and fear caused by the attack, until finally something entirely unexpected by either Martian or human comes along to break the cycle. Baxter replicates this approach. He starts by creating an alternative history, speculating how the First Martian War would have altered the course of the next couple of decades. This is quite fun – WW1 happens very differently, Britain has turned into a kind of martial state, Churchill is involved in the plans to defeat any future Martian attack etc. We also meet the two people through whose eyes we mainly see the story develop – Julie, a journalist, and ex-wife to Frank, a doctor (and brother of the narrator in the original). At this early stage I was quite enjoying it in a mild kind of way. But then the Martians arrived. We attacked them with our little guns. They killed us. We attacked them with bigger guns. They killed us. We attacked them with great big guns. They killed us. We attacked them with their own guns... well, you get the point. Now, as I said, this is pretty much what happened in the original too. But there is one huge, major difference. The original is 208 pages long – this one is listed as 464, but my uncorrected proof copy from Amazon Vine actually comes in at roughly 540 largish pages. Apart from the length issue, I found I hadn't developed any concern for the major characters. Partly this is because I found the writing rather flat, and the female character rather unappealing. But largely it's because within the first few chapters the author lets us know through some clumsy foreshadowing that they both survive! And furthermore, that they meet up again after the war and collaborate on this book – hence we know straightaway that mankind clearly isn't massacred after all! Telling me about the sudden deaths of thousands of fictional soldiers I've never been introduced to doesn't have the same emotional impact as would fear for one character I'd grown to care about. If memory serves me right, in the original, the narrator, and therefore we, were concerned about the whereabouts and welfare of his missing wife. I'm afraid that by the time I reached page 150 the basic premise (we attack – they kill us) had already been repeated three or four times, and I decided I couldn't face hundreds more pages. Usually I'd give an abandoned book 1 star, but truthfully this is reasonably well written and the spirit and style of the original have been largely maintained. I didn't hate it, it was just too long for its content and too repetitive to maintain my interest. Pity. I will start by saying that I am still figuring out how I feel about this book. First of you have to realise that HG Wells The War of the Worlds was one of the first Science Fiction books I read and helped fire my love of reading and all things speculative. So when I heard that there was an official sequel coming out - not just another hack story riding on the back of the famous title - I had to read it. Lucky for a meal an offer came along and I picked it up for next to nothing (though I am get I will start by saying that I am still figuring out how I feel about this book. First of you have to realise that HG Wells The War of the Worlds was one of the first Science Fiction books I read and helped fire my love of reading and all things speculative. So when I heard that there was an official sequel coming out - not just another hack story riding on the back of the famous title - I had to read it. Lucky for a meal an offer came along and I picked it up for next to nothing (though I am getting a hardback sent to me). So how do the two books relate- well first of all you have the various narratives (and yes in parts they do split up and follow their own paths around the world) taken from family members and characters from the original. Not only that but you get a lot of references to the original which by the time of this book had been published as a set of memoirs of the original events. In fact there is a scene with a doctor who actually quotes paragraphs from the book as some form of anecdotal analysis of their condition. Its refreshing to see one book refer to the other in such a seamless and reverent way. How about the story well- and here come my no spoilers - its set in a similar first person experience however the writing style has been smoothed out - its less jarring that the original but still contains a lot of the mixture of introspective analysis and first hand observations of the events. The story does introduce a lot more aspects to the story and the ending is a little ambiguous (there is a conclusion but there are still story references which are not addressed or concluded. However there is much more to praise about this book - from the various accounts from other locations around the world to examination of how such events affects the survivors and participants. I can see that a book such as this would split opinions, after all Baxter has approached a classic and he has stamped his own style on it, but he has done it in a sympathetic and realistic manner such that if you have not read War of the Worlds - its almost instigated that you do so. Fourteen years after the initial Martian invasion was defeated with the common cold, Mars is again planning a siege of Earth. Mars and Earth are at their closest distance and astronomers have observed cannon blasts on the Martian surface indicating that the cylinders are again approaching. They lost he first war, but they had adapted; this time planning for the conquest of the entire planet. Stephen Baxter's sequel plays homage to H.G. Wells's classic returning the reader to early 20th technology Fourteen years after the initial Martian invasion was defeated with the common cold, Mars is again planning a siege of Earth. Mars and Earth are at their closest distance and astronomers have observed cannon blasts on the Martian surface indicating that the cylinders are again approaching. They lost he first war, but they had adapted; this time planning for the conquest of the entire planet. In this, we have my most anticipated book of 2017, an authorized sequel to a foundation work of science fiction and one that I'd been waiting impatiently for since it was first announced. Within minutes of the ebook file being loaded onto my Kindle I was into it with great gusto, but after a few chapters my level of enthusiasm had plummeted dramatically. I will say from the get-go that this book seems very well crafted in a technical sense, but Baxter's presentation makes me fearful that he may have made it largely inaccessible to a modern audience. Hopefully during the course of this review we can get to the bottom of why I feel this way. The story idea is a great one, of course, in that the Martians invaders from the 1898 original novel The War of the Worlds come back to Earth to have another crack. This story begins in 1920 and is effectively an alternate history story with a sci-fi base. The book is stocked with plenty of characters from the original novel and the narrator of this book, Julie Elphinstone, is one of these. The writer of The War of the Worlds, referred to within this book as "The Narrative", is named as a certain Walter Jenkins and it is his continuing obsession with the Martians and his predictions of their actions which drives this story forward. He commissions Julie to carry out a task for him to try to regain some control in the situation with the invaders. The military hijack her mission and Julie is thrust headlong toward the Martian stronghold. Much has changed in Britain and Europe after what after the events of the first Martian War, World War One has been fought but the outcome and resulting political landscape are very different. Britain is ruled by a corrupt military government in cahoots with Germany, who now control most of Europe. Some technology has been gleaned from the remnants of the Martians and this has been pressed into service in the form of mechanized weapons and there is a whole industry trying to harness the power of the atom. Along the way much is revealed of the Martian plans for their mission here on Earth. Also revealed are some other extraterrestrial species and these play various roles in the story. I must admit that this is an enjoyable element to the story that I didn't expect. Also enjoyable is the cool post-steampunk feel in places, like huge Zeppelins and massive armored land-ships. The Martians eventually land on other parts of our planet as well and expand their assault. For much of the book the story jumps between Julie's first-person account and various other third-person accounts from these other places. The pace does pick up noticeably in the second half which is just as well because the first half is (I thought) annoyingly slow. Coupled with this, Baxter uses a language style which would be appropriate if it were written during the period in which is is set, but there is a large amount of time spent with needless descriptions of the scenes and the things in them. Maybe the author felt this old-school stuff necessary in order to achieve the desired period feel but it makes it really drag and I soon found it quite a chore to read. I can see a lot of people giving up on this part way through, which I nearly did a couple of times. What kept me going was my desire to finish it, to see what happens at the end. Most of all, I really wanted to write a glowing review of this massively anticipated novel but, sadly, that isn't to be. If I'm really honest with you, I should've given up because I don't think that the conclusion of the story offered anything all that rewarding. It was okay in a thematic sense, but it wound down rather anticlimactically and left me feeling quite flat. The way is left open for continuation, there being a number of loose ends left dangling but, if there is, I don't think I will be leaping up to read it, not if it's anything like this book. I'm certain that Mr. Baxter put a lot of hard work into this book but I don't think that he or the publisher got this one right at all. That is only my opinion, of course, but it's not often that I feel as disappointed with a book as I have with this one. I was pretty excited to hear that one of my favorite authors was going to write an authorized sequel to one of the books that got me excited about science fiction as a young kid. War of the Worlds was one of those books I would reread at least once a year. Unfortunately, this sequel just didn't provide enough that was new and fresh to merit the wait and to merit this book's length. I see Goodreads listed it at 464 pages, but it felt like 600 + to me. Let me start off with what I did like about t I was pretty excited to hear that one of my favorite authors was going to write an authorized sequel to one of the books that got me excited about science fiction as a young kid. War of the Worlds was one of those books I would reread at least once a year. Unfortunately, this sequel just didn't provide enough that was new and fresh to merit the wait and to merit this book's length. I see Goodreads listed it at 464 pages, but it felt like 600 + to me. Let me start off with what I did like about this book. I think Baxter did a good job at providing continuity between the original and this sequel. The novel's set up and the suspense before the invasion was very well done. I also enjoyed the alternative history take provided here, where England has turned into a quasi-authoritarian state, the first World War was never fought, and Martian technology has seeped into the world. I also liked the chapters that showed what was happening around the world during the second invasion, but I thought it was too little too late, which brings me to the story's problems. Really? Boring England again? Most of this story takes place in the exact same places that the invasion from War of the Worlds took place. I was looking for more exotic locales and perspectives, but they didn't happen until nearly the end of the book. The technology the Martians used was also pretty much the same tripod action as in the first book, and their tactics and motivations were pretty much identical as in the first one. The book just sort of dragged on and on with little to keep one interested in continuing. The action did pick up in the second half a bit, but I almost gave up before that. Sort of wish I had, because the ending was sort of blah as well. Written as a sequel to The War of the Worlds, it would be impossible not to admire the research that Stephen Baxter has done before writing this book. He refers repeatedly to The War of the Worlds and keeps his sequel true to the understanding of the solar system of Well's period instead of to what we now know. However, as a novel it struggles under the weight of his notes and at times is incredibly clumsy - characters actually refer to the War of the Worlds by saying things like, "Remember that Written as a sequel to The War of the Worlds, it would be impossible not to admire the research that Stephen Baxter has done before writing this book. He refers repeatedly to The War of the Worlds and keeps his sequel true to the understanding of the solar system of Well's period instead of to what we now know. However, as a novel it struggles under the weight of his notes and at times is incredibly clumsy - characters actually refer to the War of the Worlds by saying things like, "Remember that bit in chapter seven." And, despite taking a good fifty-odd pages to set up the world, there is almost no sense of place. Historical framing is pretty much limited to a repeated mentioning of the existence of Winston Churchill and characters are little more than mouthpieces for dialogue, completely untethered from a time or location. Somewhere in the creative process, Baxter concentrated too much on doing right by Wells and forgot the reader completely - something that could never be said of the original. Really couldn't get into this - the thought of plodding on for hundreds of pages filled me with dread. I'm sure others will love it though. Just to say that in Canada this book will be titled "The Massacre of Peoplekind". Thank you Penguin Random House for the ARC. To prepare myself for this book, I re-read the original story by H.G. Wells. And I would suggest this to anyone reading Baxter's story. It will introduce you to everyone who is a major figure in the sequel. What sucked me in the most was Baxter's use of alternative History. He made his earth a very Wellesian place. Try and find this one when it has its mass release. This is an authorized (by HG Well’s estate) sequel to The War of the Worlds by H.G. Wells. Firstly, I have to admit that I am wary about any sequels, especially written by someone other than the original author. I think that the majority of such sequels are just an attempt to milk the existing money cow a bit more. However, bearing in mind that the original is 120 years old and not exactly a fresh bestseller and also that I heard accolades regarding the author’s other books, I decided to give it This is an authorized (by HG Well’s estate) sequel to The War of the Worlds by H.G. Wells. Firstly, I have to admit that I am wary about any sequels, especially written by someone other than the original author. I think that the majority of such sequels are just an attempt to milk the existing money cow a bit more. However, bearing in mind that the original is 120 years old and not exactly a fresh bestseller and also that I heard accolades regarding the author’s other books, I decided to give it a try. I wasn’t disappointed. There are several layers in the original book. Secondly, the sequel actively debates with the original narrative. For example, in the original the narrator says that he want to get to his wife, but as story progresses, he move further away from the place she should be and into the danger. The sequel, written by the former wife of the original narrator’s brother from the start shows similar ‘holes’ in the Narrative, as the war of the worlds is known in this world, creating the great case of an unreliable narrator. Great work there. Thirdly, Wells was a social reformer and the war of the worlds was an inti-colonialist pamphlet. Here the sequel falls short – it mentions different social issues, from suffragist movement to inequality and downsides of dictatorships, but doesn’t dwell on it. Unlike the war of the worlds, where most characters went unnamed, here we have a lot of names, including many real life people like Churchill, Tsiolkovsky or Patton. This creates nice allusions for everyone, who knows a bit about the XXth century, absent in the original. It even indirectly mentions Wells himself! Overall, as a sequel it is quite nice, especially if prior to reading it you read the war of the worlds and then the wiki page about it. What a sequel! Hats off to Baxter for this incredible official follow-up to HG Wells' classic 'War of the Worlds'. A masterpiece!! As haunting and brilliant as the first. More than 100 years old War of the worlds is about as classic as science fiction gets. The novel is one thing, but when you add the radio drams, TV shows and various films the reach of WoTW is hard to measure. Every first contact or alien invasion novel, TV show or film since is in it's shadow. Normally I would think it was a pretty ballsy move to write a sequel that is in many ways the first earliest sci-fi novel. I know there are examples from Frankenstein and more that predate it but in many More than 100 years old War of the worlds is about as classic as science fiction gets. The novel is one thing, but when you add the radio drams, TV shows and various films the reach of WoTW is hard to measure. Every first contact or alien invasion novel, TV show or film since is in it's shadow. Normally I would think it was a pretty ballsy move to write a sequel that is in many ways the first earliest sci-fi novel. I know there are examples from Frankenstein and more that predate it but in many ways WoTW is the first true classic of the genre that balances depth with pulp appeal. Kudos to the Wells estate who authorized this, Baxter appears to be the guy to do it. He is a self professed Wells expert who already wrote a sequel to The Time Machine, and From the research he did into not only the original but the history of the times - he was the right before for this job. That is what makes this book something really special. The details and history of the novel is treated just a carefully as the history of the early 20th century. Real life figures play into this novel that takes in and around the 1920's. The aftermath of the first Mars invasion has effected the entire planet. Germany and Russia are at war and france has fallen to Germany. But everyone comes together for one foe. There is a limited peace as Mars and Earth's orbits are in opposition around the sun. Everyone is tense as they orbits are about to line up. Once they do the Martians return The war is on and wider, in slow motion humanity watches the launch of the Martian attack and have time to prepare. The war in this novel is wider and more global seen through the eyes of a unlikely narrator. The Sister-in-law of the first book's POV Walter Jenkins. Julie Elphinstone is a fantastic voice for the book, a strong female lead in a era that was still filled with sexism. I admit I was surprised by the choice but it worked great for the novel. Characters often underestimated her, and as she becomes important to the war effort she comes into her own. Without major spoilers there are major surprises throughout the solar system in this novel. Baxter uses research done in this century to add flavor but he also is willing to use ideas that would be considered out of date. I liked that he mostly used the science of Mars that would have existed in 1920. With a tiny dash of modern knowledge for flavor. I’ll begin with an admission. I came to War of the Worlds in reverse. I am a child of the nineteen seventies (yes I do know I am hideously old, thanks), and my first exposure to War of the Worlds was the musical concept album by Jeff Wayne. I still have a fond place in my heart even now, forty years later. After the musical I moved onto the George Pal movie version which is shlocky, if massively inaccurate, fun. When I did finally get to the H.G. Wells book, I was completely entranced. It perfectly captures the society it was trying to depict and you can easily see why it is considered a science fiction classic. When I heard that a sequel authorised by the Wells estate was in the works, I was excited and apprehensive in equal measure. Could any author live up to Wells’s vision? The author who has stepped up to this challenge is Stephen Baxter, and I’m pleased to say he has done a great job of expanding on H. G. Wells’s original story. I’m embarrassed to admit that I’ve not read any of Mr Baxter’s other novels. I suppose the one positive of this oversight is that I had no preconceived notions going in. The narrative picks up fourteen years after the first book. Walter Jenkins, the unnamed narrator of War of the Worlds, is a shell of the man he once was. The horrors he experienced during the Martian War have left him scarred, both physically and mentally. His marriage has failed and he is obsessed with the red planet and it inhabitants. He has never been able to shake the feeling that the Martians will return. Fortunately, there are many others across the planet who feel the same. The Artilleryman, Albert Cook, also returns. His slightly deranged world view was a treat in book one, and he is as opinionated as he ever was. I’m glad to see him back; outspoken characters are always great fun. Others also reappear. I think it is fair to say that all their lives have all been irrevocably changed. There are some clever little twists in Baxter’s alt-history of the early twenty century. The First World War never happened. Britain and Germany are still on speaking terms but there is still a whole lot of antagonism across Europe. Germany has conquered France and is involved in an ongoing conflict with Russia. Baxter also peppers the text with some famous faces, Churchill and Einstein to name but a few. Even H.G. Wells gets a mention. It’s these nice additional details that help elevate the narrative into something special. I’m a firm believer that the best sequels succeed when they don’t just re-run the original story, they enhance it. War of Worlds is centred specifically in England, and doesn’t really mention the rest of the world at all. I want my alien invasions to be a bit more awe inspiring than that. I want to feel the huge scope of what is going on. The Massacre of Mankind does up the ante quite considerably and makes the Martians return feel like a genuinely global event. There are a handful of chapters that detail the invasion across the world from Australia to China, South Africa to India. One of things Baxter manages to capture early on is the same insight that Wells achieved in the original novel. In War of the Worlds, England is so self-assured when it comes to their superiority. There is an implied smugness. The British have never met an enemy they cannot beat. Baxter scales up this idea and then some. In The Massacre of Mankind, the reader gets to view how the Martian’s return affects the entire planet. Humanity’s complacency remains self-evident. Rather than protect or defend themselves when the Martians arrive in New York hundreds flock towards the landing site for a bit of a look. The general populace has little consideration that these otherworldly enemies may have evolved over the fourteen years that have passed since their first arrival. It doesn’t occur that any retribution might be forthcoming. I’ve always dreamed that there would be a big screen adaption of War of the Worlds that was set in the correct century and followed the plot from the novel faithfully. Now that I’ve read Baxter’s sequel, I think there might need to be more than one. So wird das Buch auf dem Cover beworben und tatsächlich steht der Menschheit, 14 Jahre nach dem 1. Krieg, eine weitere Invasion der Marsianer bevor. Die Protagonistin Julie ist die Ex-Schwägerin des Ich-Erzählers aus „Krieg der Welten“ und fungiert hier als Chronistin der 2. Invasion, die ganz anders verläuft als gedacht, denn die Marsianer haben aus ihrer Niederlage gelernt und das Ausmaß ihres erneuten Angriffs ist wirklich erschreckend. Zu Beginn des Buches wird der Inhalt von „Krieg der Welten“ kurz angerissen, wobei ich die Lektüre dieses Klassikers im Vorfeld trotzdem empfehle, da sich „Das Ende der Menschheit“ auf einige Details des „Vorgängers“ bezieht, die nicht näher erläutert werden. Außerdem treffen wir im Verlauf der Geschichte auf einige Charaktere aus „Krieg der Welten“, unter anderem auf den Ich-Erzähler und Protagonisten selbst, der mittlerweile in Berlin lebt und durch seine Obsession mit den Marsianern als merkwürdig gilt. Gerade der Umgang mit dieser Figur und seinem Bericht des 1. Krieges ist durchaus speziell und besser zu verstehen, wenn man den Klassiker kennt. Vermutlich sollten damit falsche Erwartungen von vornherein zerschlagen und das Buch vor Vergleichen mit „Krieg der Welten“ geschützt werden. Tatsächlich hatte ich einige Schwierigkeiten mit dem Schreibstil und musste schnell feststellen, dass sich dieses Buch auf andere Aspekte konzentriert als der berühmte Klassiker. Und so fehlten mir hier die philosophischen Aspekte dieses Krieges, der den Menschen als Krone der Schöpfung in Frage stellt und mit einer sehr viel fortschrittlicheren Spezies konfrontiert. Stattdessen ist dieses Buch ein spannender Unterhaltungsroman, der seinen Fokus auf Kriegsstrategien zur Vernichtung der Marsianer richtet und deren Ausführung detailliert beschreibt. Leider besteht ein großer Teil des Buches aus der Beschreibung beschwerlicher Reisen von einem Handlungsort zum nächsten, die man meines Erachtens deutlich hätte abkürzen können. Gut fand ich hingegen die Tatsache, dass die Menschheit die zurückgelassenen Technologien der Marsianer aus dem 1. Krieg in der Zwischenzeit ausführlich untersuchte, nutzbar machte und dadurch eine alternative Geschichte erzeugte, in der bspw. die Titanic nicht sank als sie auf den Eisberg traf, sondern durch die Verwendung von marsianischen Materialien lediglich einen Kratzer abbekam. Solche Details haben mir beim Lesen sehr viel Freude bereitet. Außerdem fällt der zweite Angriff der Marsianer deutlich heftiger aus und ist in seinem Ausmaß wirklich schockierend. Das gab dem Buch eine gehörige Portion Spannung und gab mir gleichzeitig ein Gefühl der Genugtuung gegenüber der menschlichen Arroganz. Leider konnten mich die Charaktere überhaupt nicht überzeugen. Ich fand sie schwach gezeichnet und ziemlich farblos. Die Beweggründe der einzelnen Personen wurden zu wenig ausgearbeitet und die Dialoge erschienen mir sehr unnatürlich, sodass mir die Charaktere und ihr Schicksal über das gesamte Buch hinweg gleichgültig blieben. Obwohl das Cover und auch der Klappentext darauf hinweisen, dass diesmal die gesamte Welt von den Marsianern angegriffen wird (In „Krieg der Welten“ beschränkt sich die Invasion auf London), gibt sich das Buch meist mit einer kurzen Erwähnung dieser Angriffe zufrieden. Lediglich die Invasion von Amerika wird noch etwas ausführlicher behandelt. Dennoch spielt sich wieder der größte Teil der Geschichte in London ab. This sequel to H.G. Wells’ 1897 classic The War of the Worlds will soon be released in the US by Crown, a division of Penguin Random House. I received a kindle format ebook at no cost, prior to release, in return for publishing an honest review. I’ve previously read a great deal of Stephen Baxter’s work, and while I don’t love everything he writes, I do consider myself a fan of his hard-sf style. He has previously written a sequel to H.G. Wells’s The Time Machine entitled The Time Ships, that was This sequel to H.G. Wells’ 1897 classic The War of the Worlds will soon be released in the US by Crown, a division of Penguin Random House. I received a kindle format ebook at no cost, prior to release, in return for publishing an honest review. I’ve previously read a great deal of Stephen Baxter’s work, and while I don’t love everything he writes, I do consider myself a fan of his hard-sf style. He has previously written a sequel to H.G. Wells’s The Time Machine entitled The Time Ships, that was very successful and that I recommend. The War of the Worlds was a very important book in the history of science fiction, and the fact that this sequel is authorized by the H.G. Wells Estate does speak highly. One departure from H.G. Wells, is that Baxter names all the characters. Both the narrator and the narrator’s brother are unnamed in The War of the Worlds. But we now know they were Walter and Frank Jenkins. The POV character of The Massacre of Mankind is a minor figure in the original novel who was actually named (the young Miss Elphinstone). She is now Julie Jenkins (nee Elphinstone), aspiring journalist and ex-wife of Frank Jenkins. Apparently, the encounter between the two of them mentioned in The War of the Worlds, has led to a failed marriage. Likewise, Walter Jenkins is now divorced from the wife he essentially abandoned during the Martian invasion of SE England. These personal life developments, and a few others, are quite reasonable speculations based on what happened to the characters in the original novel. The setting starts in the 1920 English countryside, not too far from the site of the earlier Martian landing. It is essentially an alternate history, in which the 1907 Martian invasion is popularly known through the published narrative of Walter Jenkins (which is of course, the text we know as H.G. Wells’ The War of the Worlds). That conflict is now known as The Martian War of 1907. Since there has been no First and Second World War as we know them, the term “first war” has become a reference to the Martian War. However, by 1920, Germany has come to dominate central Europe with the tacit consent of England, and a protracted German/Russian War is taking place. There are occasional references to other events from our own world, particularly concerning cultural events such as the 1938 radio broadcast version of The War of the Worlds, but they are incidental to the world-building, and I think a wink from Stephen Baxter for the amusement of the reader. Also, the astrophysics of this universe is consistent with knowledge and theories of 1900, and not our current understandings. It is taken as real that planets further out from the sun are older, and have more advanced inhabitants. The conflict between Earth and Mars is therefore extended with consistent speculations regarding Jupiter and Venus. The Martians have learned from their vulnerabilities of the first war, and seem far better prepared this time. From their perspective, the whole first war was merely a scouting expedition. Of course, the national leaders of Earth have become complacent with unreasonable faith in their ability to defeat the Martians in the same way. This invasion goes much faster, and is not limited to a single site. One complaint I have is that Baxter repetitively describes the same sequence of events through the eyes of new POV characters at each of the invasion sites. As you remember, the resolution of the first war was accomplished deus ex machina, by having all the Martian invaders die unexpectedly of an Earthly virus. This next resolution is also somewhat abrupt, but only after two full years of Martian occupation. During the occupation, Baxter draws parallels and makes commentary on British Imperialism, which is consistent with H.G. Wells’ own perspectives. And this resolution comes about through the insights of some main characters, rather than sheer accident, so is more satisfying – even while leaving new ambiguities for the future. I really wanted to like this book. H. G. Wells's original novel was one of my favorite books growing up, and I really enjoyed Stephen Baxter's sequel to The Time Machine. And by and large what he has written is an entertaining book, filled with action and brimming with speculation as to how, in its aftermath, a turn-of-the-century world might have been changed by the first Martian invasion. And yet there are serious flaws that prevent this from being as successful of a work as Baxter's The Time S I really wanted to like this book. H. G. Wells's original novel was one of my favorite books growing up, and I really enjoyed Stephen Baxter's sequel to The Time Machine. And by and large what he has written is an entertaining book, filled with action and brimming with speculation as to how, in its aftermath, a turn-of-the-century world might have been changed by the first Martian invasion. After reading several unfavourable reviews, I was feeling unsure whether or not I wanted to invest in this sequel as a fan of the HGWells original. Luckily I decided to follow my gut instinct and give it a try and I'm so happy I did. First of all, we are all aware of what a classic work of literature the war of the worlds is and whether or not it needed a sequel is debatable, I feel a scenario like that is always left open for interpretation and Baxter has lovingly crafted a work of fantastically After reading several unfavourable reviews, I was feeling unsure whether or not I wanted to invest in this sequel as a fan of the HGWells original. First of all, we are all aware of what a classic work of literature the war of the worlds is and whether or not it needed a sequel is debatable, I feel a scenario like that is always left open for interpretation and Baxter has lovingly crafted a work of fantastically imaginative science fiction with Wells' heart and original at the centre. His love and respect for the original shines throughout and without spoiling any of the epic storyline, he takes the storyline to dizzying new heights and in my opinion only adds new and fantastic layers to the world that wells created. "Das Ende der Menschheit" ist der Versuch von Stephen Baxter an den Klassiker „KRIEG DER WELTEN“ von H.G. Wells anzuknüpfen, der 1898 das Genre "Science-Fiction" quasi erst erschuf. Ich habe H.G. Wells' Roman als Teenager verschlungen. Science-Fiction war schon immer mein Ding. Mein allerliebstes Buch vom Großmeister dieses Genres war "Die Zeitmaschine" - auch als Film, das Original oft kopiert aber unereicht genial! Daher musste ich einfach zugreifen, als mir die Fortsetzung von "Krieg der Welt "Das Ende der Menschheit" ist der Versuch von Stephen Baxter an den Klassiker „KRIEG DER WELTEN“ von H.G. Wells anzuknüpfen, der 1898 das Genre "Science-Fiction" quasi erst erschuf. Ich habe H.G. Wells' Roman als Teenager verschlungen. Science-Fiction war schon immer mein Ding. Mein allerliebstes Buch vom Großmeister dieses Genres war "Die Zeitmaschine" - auch als Film, das Original oft kopiert aber unereicht genial! Daher musste ich einfach zugreifen, als mir die Fortsetzung von "Krieg der Welten" angeboten wurde! Leider verspricht der Klappentext eine actionreiche Handlung mit den Marsianern als altes und neues Feindbild, die Stephen Baxter so nicht halten konnte. Langatmig ziehen sich die Militärformatierungen durch das Buch. Es liest sich wie ein Kriegsbericht - nicht wie ein spannender Roman. Ich gebe zu, ich habe mehr als einmal daran gedacht, das Buch abzubrechen. Habe es auch immer wieder zur Seite gelegt und ein anderes Buch zwischendurch gelesen. Das hat es aber natürlich auch nicht besser gemacht. Letztendlich habe ich mich dann doch durchgequält in der Hoffnung dass der Geist von H.G. Wells doch irgendwo schlummert. Dem war nicht so. Selbst das - zugegeben geniale Cover - verspricht mehr, als der Inhalt halten kann. Mir haben die Kampfmaschinen der Marsianer, wie sie unsere Wahrzeichen zersören außerordentlich gut gefallen. Der Comicstil lässt mein SciFi Herz höher schlagen. This is some good old fashioned Earth-based alien sci-fi. HG Wells was basically the grandfather of science fiction; the fact that this author was sanctioned by the HG Wells estate to write the sequel to War of the Worlds and pull it off perfectly is bragging rights not many can claim. This reads exactly like the style of writing from the Wells period. I never actually finished War of the Worlds--I tried reading it in third grade in an inspired attempt at sophistication--and haven't picked it up This is some good old fashioned Earth-based alien sci-fi. HG Wells was basically the grandfather of science fiction; the fact that this author was sanctioned by the HG Wells estate to write the sequel to War of the Worlds and pull it off perfectly is bragging rights not many can claim. This reads exactly like the style of writing from the Wells period. I never actually finished War of the Worlds--I tried reading it in third grade in an inspired attempt at sophistication--and haven't picked it up since. However I do remember enough to say this book totally warrants its reputation as an admirable addition. For me, the best part were the introductions to each alien species. Meeting the aliens from Mars and Venus and learning about the aliens from Jupiter were the best part, hands down. As a child, this was the kind of book that had enough scientific "fact" to make me believe there really were Jovian aliens keeping watch on our galaxy. Really with the depth of description here, it seems like a foregone conclusion. Of course every planet in our solar system has its own inhabitants! I'm a sucker for books that develop themes set up by authors; I loved "The Time Ships" which continued "The Time machine" and I've read almost all the continuations/developments of "War of The Worlds" such as "Global Dispatches" and "Scarlet Traces", so I was really looking forward to "The Massacre of Mankind". Well, it lived upto my expectations. The story is written in a very similar fashion to the original; a narrator (this time female) acting as our focal point, with the occasiona Excellent! 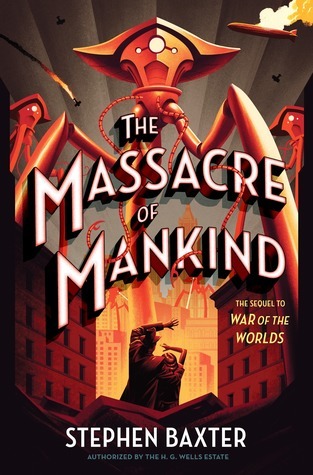 I'm a sucker for books that develop themes set up by authors; I loved "The Time Ships" which continued "The Time machine" and I've read almost all the continuations/developments of "War of The Worlds" such as "Global Dispatches" and "Scarlet Traces", so I was really looking forward to "The Massacre of Mankind". Well, it lived upto my expectations. The story is written in a very similar fashion to the original; a narrator (this time female) acting as our focal point, with the occasional side-step when we hear the experiences of others. It is quite gripping and doesn't introduce any elements that don't really belong, yet enough to surprise us and make us wonder (as with the original) as to what the outcome could possibly be. It has a feel of being a genuine Wellsian timeline and could so easily be a continuation of Wells' original. Бакстър има монотонен, понякога дори досаден стил на писане и тази му книга не е изключение. Прилича на хроника, която обаче не е много успешно развита. Представете си, че след първото нашествие на марсианците, познато ни от книгата на Х. Дж. Уелс, последва второ... Дали ще е готово за него човечеството, улисано в своите проблеми и вражди? Първите 200 страници са доста скучни, почти нищо съществено не се случва, героите са трудно различими, изобщо - поувлякъл се е в графоманията си автора. Не съжа Бакстър има монотонен, понякога дори досаден стил на писане и тази му книга не е изключение. Прилича на хроника, която обаче не е много успешно развита. Първите 200 страници са доста скучни, почти нищо съществено не се случва, героите са трудно различими, изобщо - поувлякъл се е в графоманията си автора. Не съжалявам, че я дочетох, въпреки разпиляния край. Бе ми интересно да проследя, как ще завърши историята на марсианските опити за завладяване на Земята. A great continuation of the War of the Worlds with Mars attacking Earth again. But they learned from their first attack and won't be defeated by Earthly diseases. Around the globe the battles rage, but it is in England where a potential solution arises. Having really enjoyed Baxter's authorized sequel to Wells' "The Time Machine" many years ago, I was looking forward to this novel. But, I have to say I was very disappointed with a lot of this book. The good things: written in Wells' style; some very good action pieces. The bad things: lots of minor characters, too many locations as the main character slogs from one place to another and back, lots of obscure British towns/locations to keep track of (and no map!! ), fairly repetitive description of Having really enjoyed Baxter's authorized sequel to Wells' "The Time Machine" many years ago, I was looking forward to this novel. But, I have to say I was very disappointed with a lot of this book. The bad things: lots of minor characters, too many locations as the main character slogs from one place to another and back, lots of obscure British towns/locations to keep track of (and no map!! ), fairly repetitive description of the Martian machines' antics, and an unsatisfying ending. So, this is an alternate history England (never part of WWI, for example) and it's over 10 years since the first invasion, and this time the Martians are sending 10x the number of cylinders. England thinks its prepared, but the Martians don't follow the script. (You can tell from the title that it will turn out badly.) Unfortunately, Baxter takes 50 pages before anything interesting happens, and then after a stomp by the Martians, they settle in to consolidate, so all we get is the main character going to multiple places to see sometimes panic, and sometimes people going about their business as if nothing happened. Then a bit of action, then lots more trudging around. I KNOW THIS DUE IN JANUARY I HAVE SEEN THE COVER ON AMAZON.THIS WAR OF THE WORLDS.THE LAST TIME WAS A SEQUEL TO THE TIME MACHINE.I MADE MISTAKE LAST TIME OF NOT BUYING IT & ONLY GETTING IT FROM THE LIBUARY THIS TIME NOT GOING MAKE THAT MISTAKE. Today The 5th of February I finished this brilliant sf sequel in back in the Acknowledgedgements he mentions a bo I KNOW THIS DUE IN JANUARY I HAVE SEEN THE COVER ON AMAZON.THIS WAR OF THE WORLDS.THE LAST TIME WAS A SEQUEL TO THE TIME MACHINE.I MADE MISTAKE LAST TIME OF NOT BUYING IT & ONLY GETTING IT FROM THE LIBUARY THIS TIME NOT GOING MAKE THAT MISTAKE. Today The 5th of February I finished this brilliant sf sequel in back in the Acknowledgedgements he mentions a book by Peter J.Beck War of the Worlds:From H.G.Wells To Orson Wells,Jeff Wayne,Steven Spielberg & Beyond its was published in 2016.That I now just got to buy next. He gives you really good info on all his facts & other books he used.Other fiction writers too. Stephen Baxter hat sich an die Fortsetzung eines der größten Werke der SF-Literatur gewagt. Er hat sich sehr viel Mühe gegeben, dem Original gerecht zu werden und in direkter Kontinuität zu diesem die Geschichte weiter zu erzählen. So finden wir eine Vielzahl der, im Original noch namenlosen, Protagonisten wieder. Auch eine Vielzahl von, wie heisst es so schön im Neu-Deutschen, „Easter Eggs“ kann man entdecken, mit Referenzen nicht nur zu H.G. Wells sondern auch zu Orson Welles Hörspiel aus den Stephen Baxter hat sich an die Fortsetzung eines der größten Werke der SF-Literatur gewagt. Er hat sich sehr viel Mühe gegeben, dem Original gerecht zu werden und in direkter Kontinuität zu diesem die Geschichte weiter zu erzählen. So finden wir eine Vielzahl der, im Original noch namenlosen, Protagonisten wieder. Auch eine Vielzahl von, wie heisst es so schön im Neu-Deutschen, „Easter Eggs“ kann man entdecken, mit Referenzen nicht nur zu H.G. Wells sondern auch zu Orson Welles Hörspiel aus den Dreissiger Jahren.